Konami announced Frogger: Hyper Arcade Edition is arriving this Spring for the PlayStationNetwork for the PlayStation3 computer entertainment system, Xbox LIVE Arcade, and Nintendo’s WiiWare. The game will also be available for smartphone platforms. Frogger’s coin-op thrills are back and better than ever in Frogger: Hyper Arcade Edition! The arcade excitement of Frogger returns in time for its 30th anniversary celebrations with updates that are sure to delight fans old and new. Players can jump into the action with classic and brand-new game modes like Tile Capture, Battle Royale, Freak Out and more that expand the challenge of Frogger’s style of run-and-dodge gameplay. Players can even customize their game experience through a variety of different skins, from the modern neon style of HYPER ARCADE to the 8-bit sprites from Frogger, Castlevania and even CONTRA! Competitive types can also throw down against friends or the CPU in up to 4 player matches to find out who’s really the top frog! First introduced in 1981, Frogger is widely considered a classic and was noted for both its novel gameplay and theme. 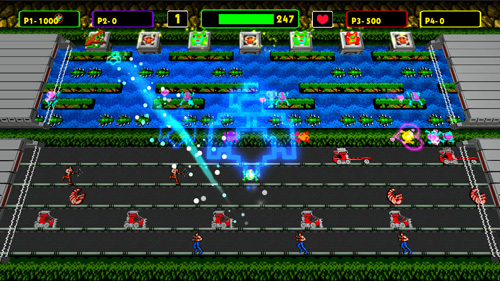 Developed by Zombie Studios, Frogger: Hyper Arcade Edition is slated for release this Spring for download on the Xbox LIVE Marketplace, PlayStationNetwork and Nintendo WiiWare. The game will also be available on various smartphone platforms. For more information, please visit www.konami.com/frogger. Check this out – Frogger mixed with Contra!